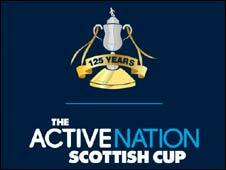 So the big freeze pretty much froze out the Active Nation Scottish Cup at the weekend. And the arguments for summer football gather pace. On the plus side the much mocked sponsorship deal worked. The moment I read Active Nation in the paper I immediately got off the couch and did 100 sit ups. Or not. That aside the games that did go ahead were quite diverting and we’ve got the added bonus of being able to enjoy this round over a couple of weeks rather than being battered by 16 ties in one weekend. At Easter Road the more optimistic predictions of 8, 9 or 10 goals for the home side proved wildly off the mark. League position aside Hibs are not actually playing all that well at the moment and they struggled to break down a determined Irvine Meadow. Cue the brave minnows being sent back to Ayrshire with hollow platitudes ringing in their ears. If we want to do more than patronise junior football then a pyramid structure and regional lower leagues are the best place to start. Please take note Henry McLeish. In the first of the all-SPL heavyweight fixtures Hearts offered proof that their recent resurgence is not yet evidence of a complete return to form. Aberdeen will have groaned when the draw was made and Mark McGhee will be more than satisfied with a 2-0 win. Circumstances are dictating that Csaba Lazlo plays a defensive game but some of his players lack the ability to mount the fluid counter attacks that make the system a success. The end result is the lack of consistency that has plagued them this season. The solution is to make some signings. Are you listening Mr Romanov? Probably not. I was quite vocal in criticising the choice of the televised game. But I’m big enough to admit I got that one wrong as Hamilton and Rangers served up a see sawing 3-3 draw. Walter Smith will be worried that his Bougherra-less defence let a two goal lead slip while Billy Reid will be worried that Hamilton let their big chance slip. Reid will be looking for his side to summon the spirit of Adrian Sprott when Hamilton travel to Ibrox for the replay. St Mirren and Dundee United were both able to overcome lower league opposition. We may have expected St Mirren to get past Alloa at home but, given their recent form, United’s trip to Firhill seemed to be a potential banana skin. Much relief then at their 2-0 win and a possible cup run to savour for whoever their new manager might be. The most one sided game of the round saw Dunfermline destroy Stenhousmuir 7-1. A good win for the Pars but one that has been marred by the threat of expulsion from the tournament. Dunfermline’s second half substitute, Calum Woods, should have been serving a suspension. We can’t say why the confusion arose but we can say that for some reason Dunfermline fielded an ineligible player. That’s against the rules and should be punished. But to throw them out of the tournament? It seems harsh. And to let a team that’s just been gubbed so emphatically back into the draw would seem to make a mockery of the whole thing. So it comes down to a choice between common sense and devaluing the world’s oldest national trophy.